The innovation and solutions are meant to cover an area under five tehsils and 8.56 lakh population. Out of this population the listenership of KVK Pravara Community Radio is estimated at 16 per cent of this population. The expansion took place in phase with initial phase encompassing establishment, statutory requirements, testing and commissioning of the KVK Pravara Community which began with transmission of four hours of programmes dedicated to agriculture, rural development, health and education in the year 2009 and subsequently expanding to six hours daily till date. The targeted community included farmers, landless, socially disadvantaged sections. For expanding the coverage or listenership of this radio, the duration of transmission has been increased. Similarly programme format has been altered with more duration, interaction and live programme rather than keeping interview based programmes. Similarly collection of old songs also has helped to attract the listeners. respondents belonged to the 30 to 45 years age group, 30.52 per cent belonged to the 18 to 30 years age groups and 18.68 per cent belonged to 45 to 60 years age groups highlighting the listenership of youngsters and youths. Literacy wise 54.21 per cent of the respondents had education level of Tenth grade and above while 29.73 per cent had education level between Eighth and Tenth grade. Only 0.26 per cent respondents were illiterate highlighting listenership being highest among the educated youths. Highest listenership was observed in married class (53.42 per cent) as compared to 11.84 per cent in unmarried group. Among various occupations, there was highest number listenership of 58.68 per cent represented by farming community followed by 16.84 per cent among village enterprise owners, 9.47 of the serving class and lowest of 2.36 per cent among non-farm sector labour class. Among the farming sector highest percentage of 50 was represented by women engaged in farming enterprise. Among the preferred media of choice by the respondents it was observed that use of radio had highest respondents of 79.47 per cent followed by TV viewers 77.36 per cent and least of newspaper reader of 58.15 per cent expressing radio being the most preferred media of choice for information and entertainment. The no. of respondents preferring daily listenership of radio was 62.89 per cent amongst all followed by infrequent listenership showing 55.78 per cent. was most likely choice by 67.63 per cent followed by 31.05 per cent listeners preferring mobile and only 1.57 as other modes. Highest number of respondents (74.21 per cent) indicated the time of listenership of evening hours while 31.31 per cent indicated the time of afternoon as preferred choice of time suitable to them indicating maximum preferred choice of evening hours during leisure when they were at home after day’s work. Only 17.36 per cent of the respondents expressed the workplace as the place of listenership while 64.73 per cent mentioned home was the best option that was most convenient to them. Among the type of most preferred program format it was revealed that listening radio based interviews was liked by 53.68 per cent respondents followed by Weekly Reviews represented by 27.1 per cent listeners and music 24.21 per cent only. This indicates the choice of gaining information through interviews as the preferred choice of program format on radio. The KVK also observed that on KVK Pravara Community Radio 31.84 per cent of respondents had a maximum preference for Krishi Vani programme followed by Aaple Aarogya a health based programme (9.21 per cent) and Dnyanganga an information based programme (4.73 per cent). Among the listenership of various programmes of KVK Pravara Community Radio it was observed that Phone-in programme and Hello Yashogatha(program on success stories) had maximum listenership followed by 3.68 per cent by Tadnyanche Bol (program on experts interviews) and 2.36 per cent by Krishi Manch program indicating agribased programmes being most preferred choice. Among the longevity of listenership it was seen that 38.42 per cent respondents were tuning to KVK Pravara Community Radio since two years followed by 26.31 per cent tuning this radio channel since last three years. Among the impact on living standard and livelihood it was revealed that 53.68 per cent respondents indicated increase in skill development as major impact of listening radio based programmes followed by impact on education and entertainment 25.78 and 25.26 per cent respectively. The radio programmes produced on agriculture and allied enterprises had maximum impact of 60 per cent as indicated by the respondents followed by health (33.15 per cent) and education (16.05 per cent). A maximum of 53.42 per cent respondents indicated that most of the agricultural problems were solved by agri-based programmes on radio followed by health related problems through health based programmes on radio (32.36 per cent respondents). 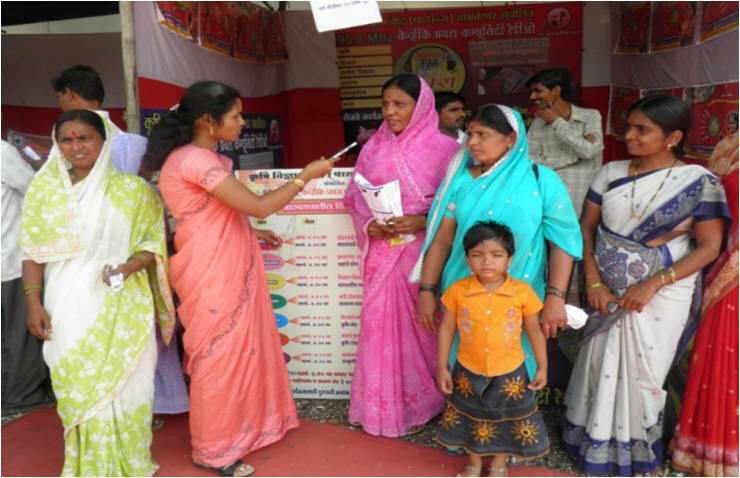 A maximum of 65 per cent respondents indicated that they had interacted on various interactive radio programmes on KVK Pravara Community Radio and 90.78 per cent respondents indicating effectivity of KVK Pravara Community Radio. A maximum of 60.26 per cent respondents indicated that KVK Pravara Community Radio was an effective solution in voicing their concerns and problems. The beneficiaries include the women, landless farmers, small and marginal farmers and socially disadvantaged sections of the community representing 16 per cent of total population. It was an ongoing effort of the KVK through its regular extension activities to make impact on farming community and after the start of KVK Pravara Community Radio, the radio correspondents of the KVK Pravara Community Radio who were spirited and volunteered further to facilitate the involvement of the marginalized and disadvantaged sections of society and the focus on participatory and interactive programme content of KVK Pravara Community Radio that led to significant impact on target community. Similarly the KVK has given major emphasis on group dynamics where Farmer Clubs and SHGs have been established that includes rural youths and farm women. This already existing network of beneficiaries has been available for the radio.